Pages, the word processing and page layout program included with iWork, has a feature that can check your spelling as you type. A similar feature is available in TextEdit, the text editor that ships with Mac OS X. Choose Edit, Spelling, Check Spelling as You Type. Misspelled words will appear with a red dotted line underneath them. To correct a misspelled word, right-click or Control-click on the misspelled word and choose from the list of suggested spellings at the top of the contextual menu. If you know the word is spelled correctly (it might be a proper name not recognized by Pages), choose Ignore Spelling or Learn Spelling from the contextual menu. 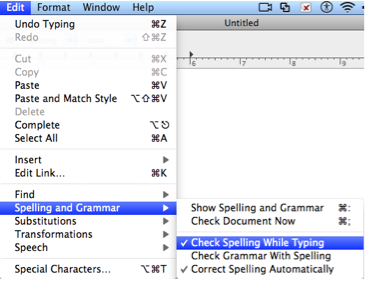 If you choose Learn Spelling, the word will no longer be highlighted as a misspelled word in your document. Choose Edit, Spelling and Grammar, Check Spelling While Typing. Misspelled words will be highlighted with a red dotted line underneath them. To correct a misspelled word, right-click or control-click on it and choose from the list of suggested spellings on the contextual menu. If you know the word is spelled correctly (it might be a proper name not recognized by TextEdit), choose Ignore Spelling or Learn Spelling from the contextual menu. 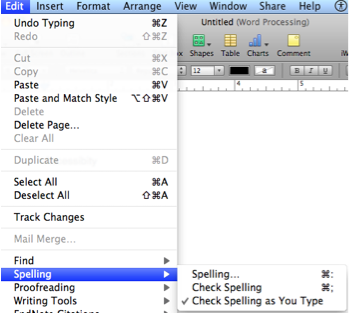 If you choose Learn Spelling, the word will no longer be highlighted as a misspelled word in your document. If you tell Pages or TextEdit to learn a spelling and want to undo this action, right-click or control click on the desired word and choose Unlearn Spelling from the contextual menu.